A new study presents a simple way to deal with out-of-control raccoon populations: scare their appetite away with the sound of barking dogs. Raccoons on B.C. 's Gulf Islands have been living the good life for more than a century, ever since their natural predators were hunted off the islands by humans. The raccoons spend day and night on the shoreline, gorging on seafood, which has had a detrimental effect on the intertidal ecosystem. But in a study published Wednesday in Nature Communications, one ecologist presents a simple solution: scare the raccoons' appetite away with the sound of barking dogs. 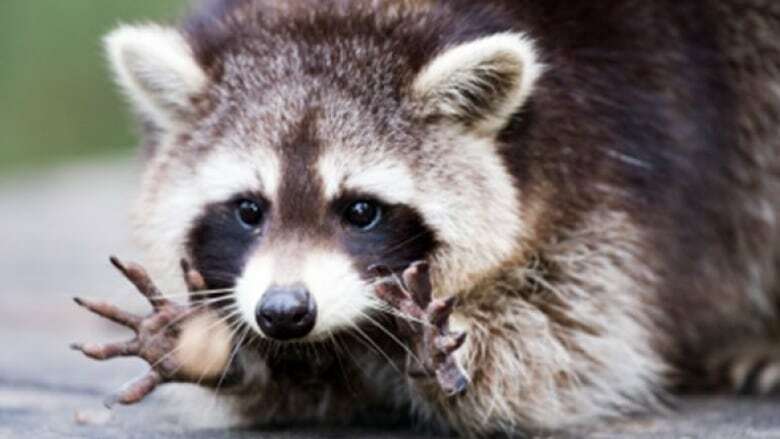 "We found that raccoons substantially reduce their foraging when they're perceiving the presence of scary dogs all around them," said University of Victoria PhD candidate Justin Suraci. The lead author of the study found that the beach came back to life after the raccoons became more wary of the open landscape. "They spend 66 per cent less time on the shoreline eating, and that reduction in their feeding was sufficient to have a huge benefit for the crabs and fish that they eat." Ecologists have suggested for years that the fear of large predators could have a positive effect on ecosystems. The theory is that by keeping their prey in check, predators can protect the plants and smaller animals that their prey eat. Suraci saw an opportunity to test this theory when he noticed raccoons on the Gulf Islands spent a lot of their time gorging on seafood because they had little to fear. "Some of these beaches on the Gulf Islands are simply loaded with raccoons," he said. "They barely ever look up from foraging." Suraci and his colleagues set up five speakers on several beaches and played various sounds, ranging from barking dogs to sea lion sounds. They found that while the raccoons ignored the sea lion sounds and continued eating, they reacted immediately to the perceived presence of dogs. "Our research definitely supports the idea that the natural re-colonization of large carnivores should be supported," said Suraci. He says this is the first time the role of large carnivore fear in food webs has been demonstrated in an experiment. The perceived presence of dogs, triggered by barking sounds, may be enough to scare the raccoons for a few months, but they will soon overcome that fear said Suraci. "They're going to realize that bark has no bite eventually and they're going to start ignoring it." Long term change would require the actual reintroduction of the raccoon's natural predators, like cougars, wolves or bears, he said. "There are potentially some short term targeted management applications you can do with just the sound of fear, but essentially if you want to do long term ecosystem restoration, you're going to really have to actually bring the large carnivores back." Ecologists often point to the reintroduction of wolves in Yellowstone National Park as an example of how carnivores can rejuvenate an ecosystem. The wolves kept the elk population in check, which in turn gave the overeaten vegetation a chance to recover, according to Suraci. Local residents may not like the idea of cougars coming back to inhabited parts of the island, but Suraci says people can look to Europe for examples of success. Wolf and bear populations there are starting to recover after centuries of hunting. "Through proper outreach and education, the local communities are dealing with them quite well," he said. "I think similar things could happen here in the Gulf Islands." To listen to the full interview, click the link labelled: Scaring raccoons is good for the ecosystem says research.